MONTEREY, Calif. - April 1, 2017 - PRLog -- Described as "One of the Top 30 Candy Stores in America" by Relish Magazine, Carousel Candies is celebrating Easter 2017 with a great promotion that benefits Special Kids Crusade on Saturday and Sunday, April 8th and 9th and April 15th and 16th. Come and take a photo with the Easter Bunny inside the store from 12:30 p.m. – 5:00 p.m. each day. Celebrating over fifty-five years of providing unique homemade sweet treats to visitors from around the world, Carousel Candies (www.carouselcandies.com) is the popular "passion pink" destination located at 31 Old Fisherman's Wharf (next to Old Fisherman's Wharf) in Monterey, CA with the antique taffy puller in the window. Carousel Candies is open 7 days a week from 9:30 AM – 11:00 PM for late night sweet cravings every day of the year. Carousel Candies will sell amazingly delicious 3- foot giant chocolate "egg-streamly " large rabbits in Belgian milk chocolate, Belgian dark chocolate, Belgian white chocolate, strawberry chocolate, as well as raspberry (bright blue) and lemon-flavored (yellow). Large 1-foot high milk chocolate, white and dark, chocolate, lemon, raspberry and strawberry rabbits. There are also sugar-free eggs and rabbits that can be personalized! 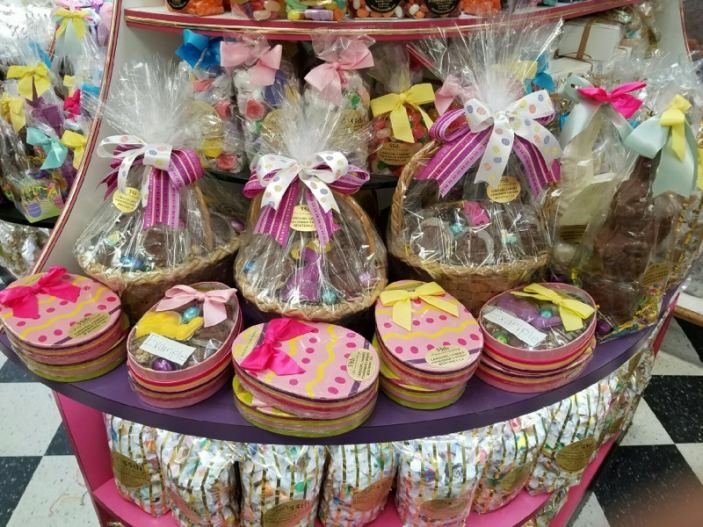 There are many beautiful Easter baskets as well as baskets made entirely of delicious dark chocolate. Team it all with an assortment of colorful jelly beans available in over a dozen flavors and don't forget to tuck in some of Carousel Candies world-renowned tasty Salt Water Taffy that comes in 50 colorful flavors plus their special Easter-themed variety. Carousel Candies produces wonderful chocolates year-round for any holiday or special occasion and also has a wonderful online store. They specialize in corporate gifts, from customized chocolate creations, to candy-of-the month packages, to edible candy baskets. Carousel Candies often works with caterers, party planners, and hotel banquet directors to incorporate customized themed chocolate treats into their clients' events. They also offer fundraising "fun to sell for a cause" products including caramel apples, candy apples and salt water taffy. The eye-catching old-fashioned pink candy-colored historic shop was featured on a recent Modern Marvels segment of the A & E History Channel and the episode is viewable on their website, www.carouselcandies.com, Coxey's Big Break, an Australian TV program, was filmed when the program came to the store for a special behind-the-scenes look at taffy-making.